Summertime is fun time, but it shouldn’t be a time of educational regression. Keep stimulating the mind of your soon-to-be second-grader with our year two summer worksheets. Featuring familiar summer themes such as barbecues, the beach, and the Olympics, these worksheets help your child keep his reading, writing, creative, and fine motor skills sharp. Don’t worry: These activities are so entertaining, he won’t even equate it with learning. Tourists love to visit the Lincoln Memorial on the National Mall in Washington, D.C. Turn a patchy day into a fun science adventure with this cloud gazing worksheet! Draw the clouds you spot, and then identify which type they are. 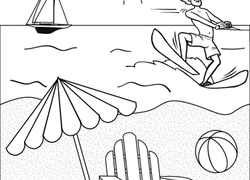 This year two coloring page features a variety of common sights to be seen at the beach. Ready for a beach day? Add a splash of colour to these bouncy beach balls and imagine you get to spend the whole afternoon on this sandy, sunny beach! 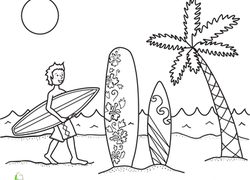 This summer coloring page features a surfer and an array of fun surfboards. Identify Father's Day on a calendar, then create a picture to share with a father you know. This fun twist on bingo has an added activity to cure car-trip boredom: coloring! Tombstone, Arizona lets visitors catch a glimpse of what life was like in the wild west. Have your kid shoot for the stars like the athletes in the Olympic Games. Your kid can imagine becoming one of the athletes while decorating this coloring page. This word search is a great way to introduce your child to new words. Challenge him to find the barbecue-related words hidden in the jumble of letters. It's summertime, and the possibilities are endless! Experience the best of summer with this bucket list, the perfect way to keep fun going all season long. What could be better than having sliced pineapple on a hot summer day? 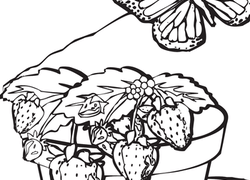 Enjoy adding some tropical colors to this fruit-lover's coloring page. YUM, here's a Hawaiian favorite that will quench your thirst on a summer day: shave ice! Add some bright colors to this fun coloring page. Give your first grader a mind-bending challenge to find the two suns that match in both size and colour. Add a swimsuit, summer shorts, and a dress to your Delilah doll's wardrobe, and have your child dress her up for fun in the sun. Got a neighbourhood barbecue coming up? Make invites easy with this fun printable invitation.